Here’s a few pictures from the Kukui Trail hike we took down into Waimea Canyon. It’s 2.5 miles from the trail head going down 2000 feet in elevation to the Waimea river at the bottom of the canyon. Let me tell you, we were pretty wiped out after we got back to the top again afterwards! Please click through to the individual photos to view them and see exif info. For the next little while I’ll be posting about our recent trip to Kauai, Hawaii. If you’re familiar with Kauai you will know that there are wild chickens everywhere! Some of them (particularly the roosters) have very nice colouration, such as the two shown here. After getting a few shots of them with my telephoto lens I put the wide angle lens on, mounted the camera on the ground, put some seed around, and used remote shooting on my cell phone to get the closeup shot of the hen. Please click through to the individual photos to view them and see exif info. Here are several photos I managed to take of some snowy owls in St. Albert, AB where I live. It was a treat to see them as I hardly ever see owls in the wild. I spent a few hours over a couple of days just watching them, hoping for more photo opportunities than just an owl sitting on a light post. They are content to just sit on light posts for a long time without moving more than their heads. Finally I got a chance to see one fly down into a field, presumably to go after a mouse or something and was able to get these shots. Click on the individual photos to see larger versions and exif details. 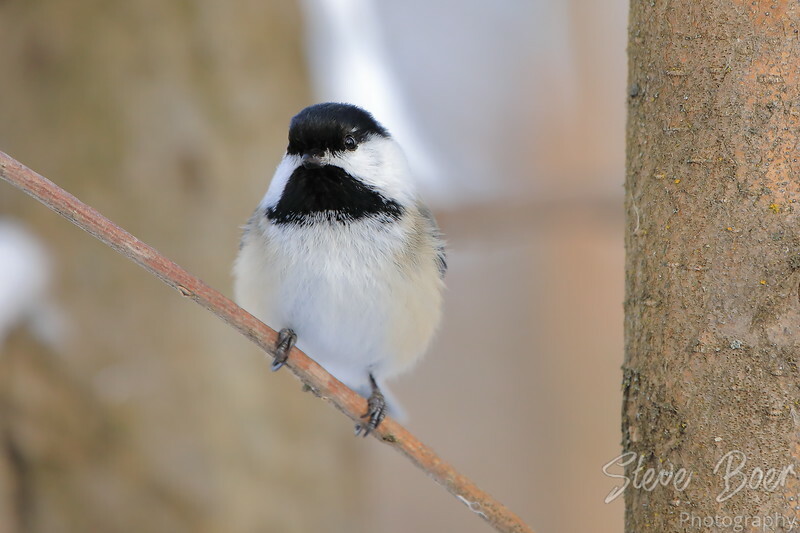 Just a Black-capped Chickadee, seen at Grey Nuns White Spruce Park in St. Albert, AB. This area is chock full of these little guys, and they will take seed right from your hand. 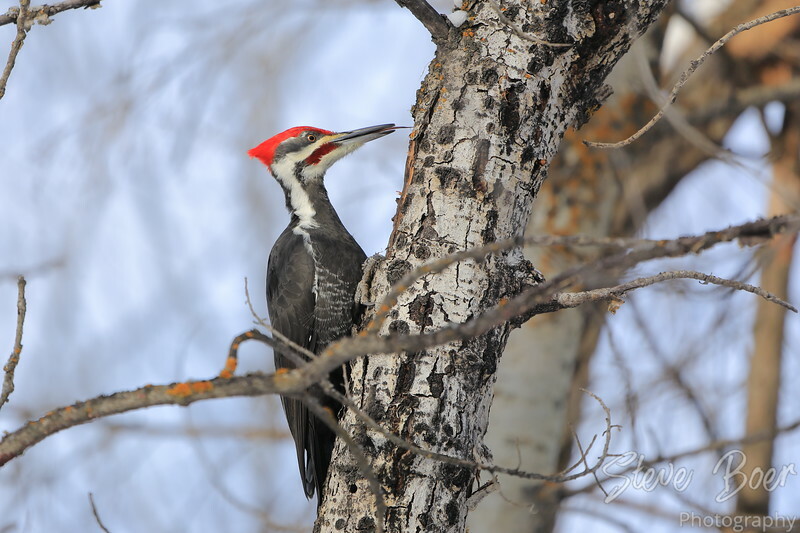 Pileated Woodpecker with his tongue sticking out, seen at Grey Nuns White Spruce Park in St. Albert, AB. Happy Valentine’s Day to my wonderful wife, Dawn! 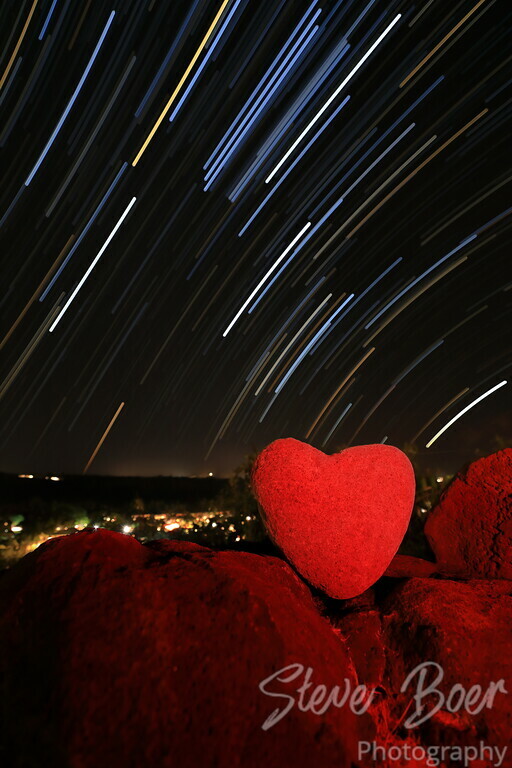 I did some light painting on this heart-shaped rock and captured a star trail behind it. A composite of 161 exposures, one interesting aspect of this image is the different colours in the stars. They were blurred because the camera was closely focused on the rock so perhaps that had something to do with it. Here’s a set of photos following a similar theme. I processed them all similarly using AuroraHDR with some presets to add some hdr effect as well as a specific filter. Click on the individual photos to see larger versions and exif details.